Ok so Christmas shopping can get a little hectic. I feel like this year time has been going by extremely fast. The year is already almost over. I was finally able to find time in my busy schedule to go shopping for some of the presents I needed to finish. I was running around the mall going crazy to find small but cute gifts to fill up some of my gift bags. Ideally, I am a fan of gift baskets. So, I love to have presents filled with a bunch of items that cater to different things the person love. For Myoshi, I knew one of her gifts early on because she mentioned she wanted a pair of shoes. However, I didn't want to just get them and be done with her gift. I wanted to add a couple of other items like a Tumblr cup. I always get her these, but recently her other one broke so I wanted to make sure I replaced it. I also wanted to get her some cute accessories for her phone like a pop socket and case. My favorite place to get these small items is from Francesca's. I'm not sure if any of you have been there but it's a small boutique inside the mall. They have tons of jewelry, accessories, hats & scarves, clothes, etc. Christmas cards are always an added plus to any gift. 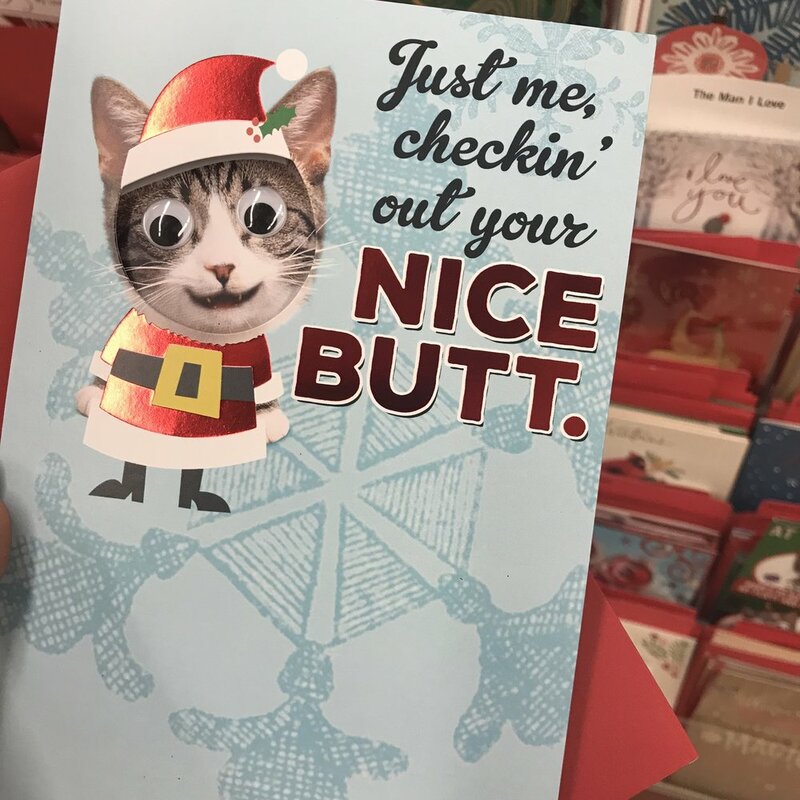 I went to Walgreens to get some Christmas cards to put in my gift bags and I thought the one below was soooo funny. I got it for Myoshi! You can even get some candles and chocolates! I went to Yankee Candles and Bath and Body Works to get some candles. You really can't go wrong with a candle. They smell good and really calm your mood. As for chocolate, who doesn't love sweets for the holidays. Also, just pay attention to the things people say. Maybe you can get away with getting a cute planner or face and body products.